Good morning, readers! I have the new KBShimmer Fall 2016 Collection to share with you today! 12 new colors, and tons of adorable names (as usual!). “Who says burgundy is the only color for Fall? 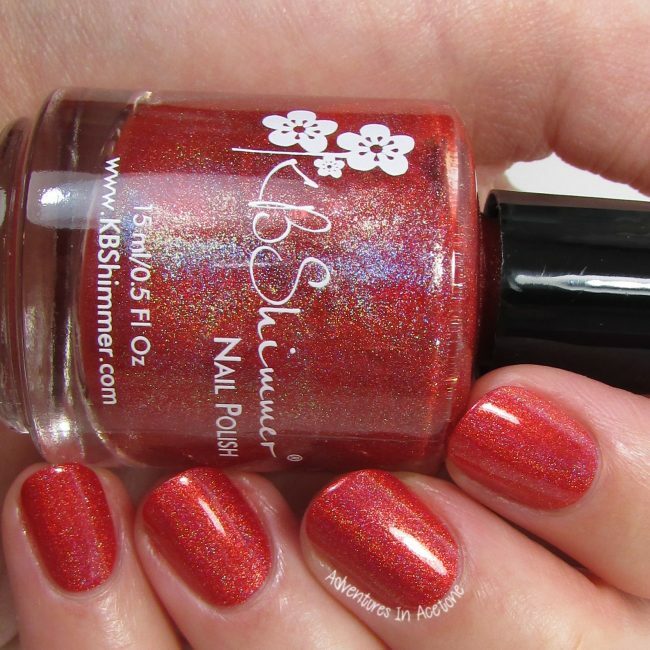 KBShimmer’s Fall 2016 Collection celebrates the many rich colors of this delightful season. Whether you’re taking a stroll in your cozy sweater, sipping your favorite pumpkin latte, or gearing up for the holidays, these lush lacquers are the perfect way to transition into the cooler autumn months!” Let’s take a look. A candy inspired white crelly. Inspired by a picture of those fun sized goodies, this polish is filled with candy wrapper colored hex glitters in blue, red, yellow, orange, green and brown. 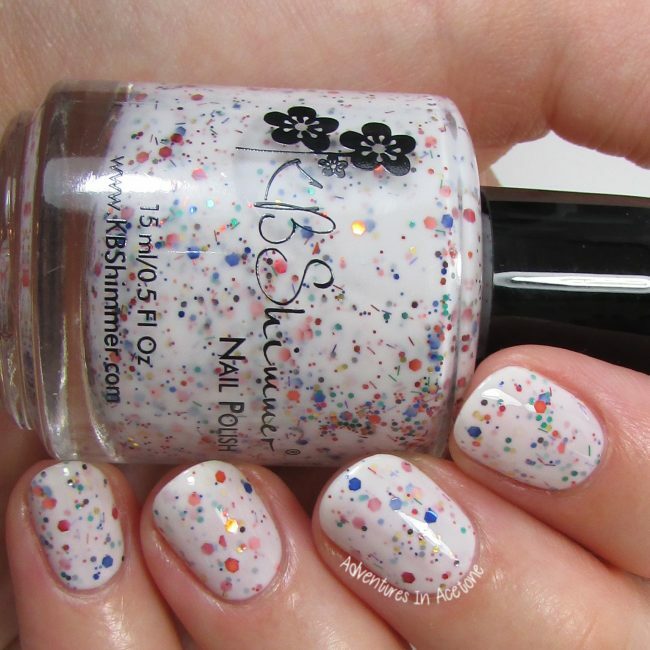 A scattering of micro slice glitters completes this sweet polish. I’m showing three coats below with top coat. I had no issues with application. 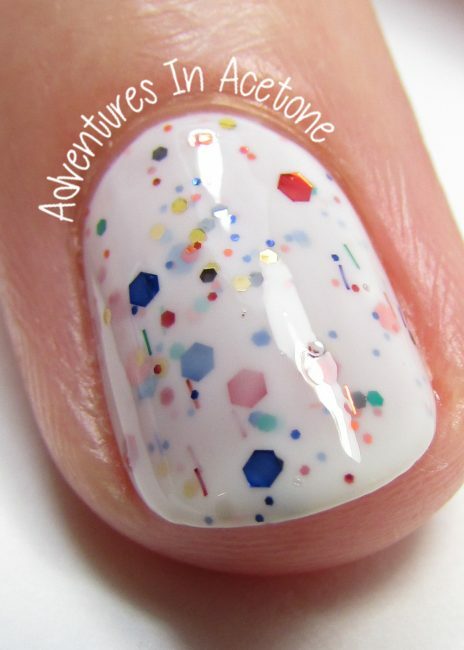 I can totally see the candy wrapper inspired details in this polish, although I cannot help but sing Adele’s Sweetest Devotion while painting this on. A new addition to our Mega Flame line, this soft peachy pink color brings to mind ballet slippers and tutus. 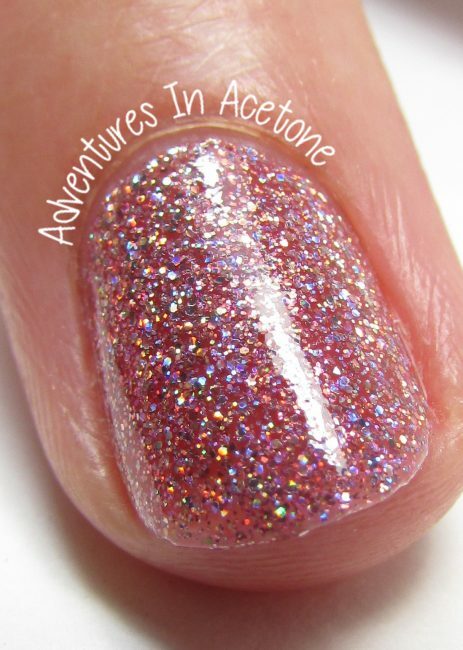 This girly polish is sure to be a favorite with its super holographic sparkle and delicate color. 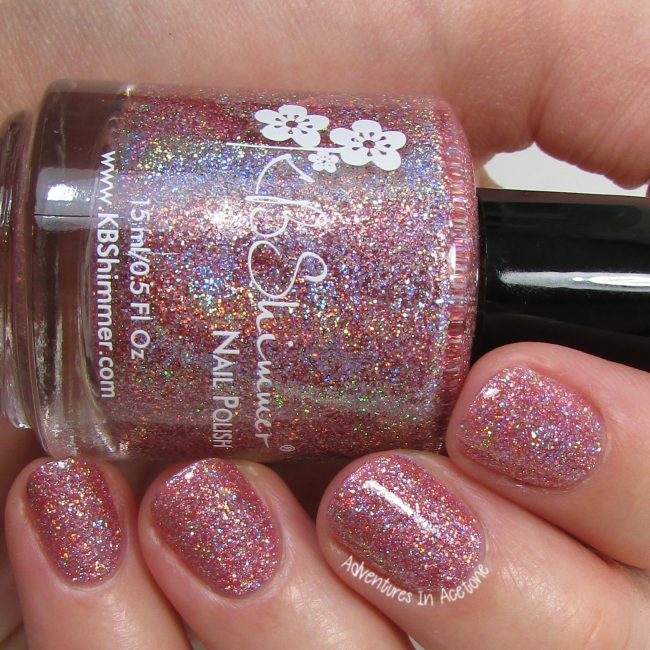 This is so super sparkly and the holo is really strong. A new addition to our line of creams, Grin And Gerbera It is a warm deep pink leaning color that has a kiss of red to it. This shade will work well in any season. This has great coverage and it was nearly a one coater! 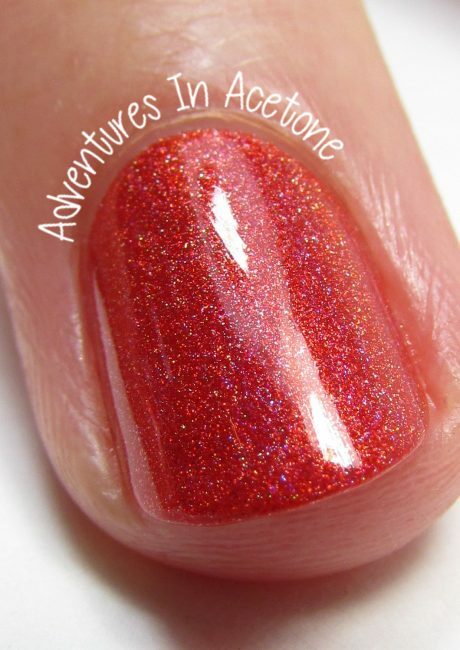 A bright, orange toned red, this linear holographic polish brings to mind that famous poppy-filled field. 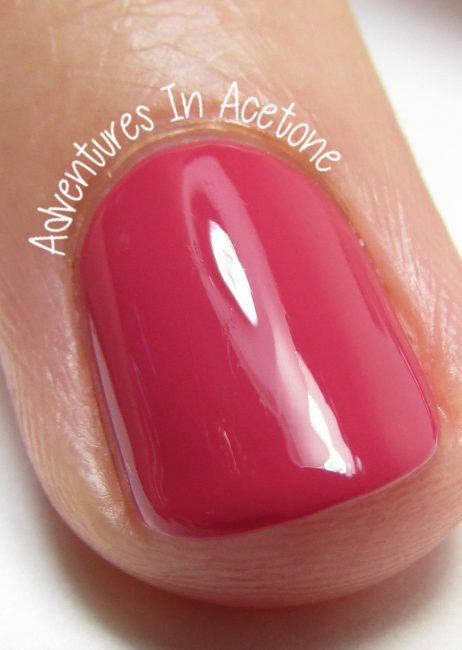 Technicolor has nothing on this bright polish. 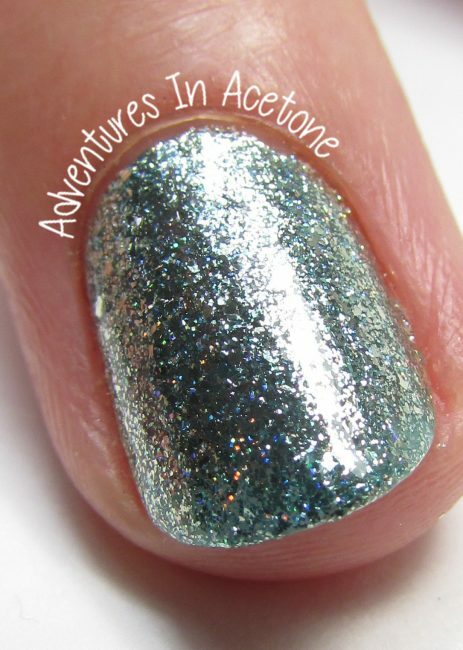 This is a really pretty shade of holo and I had no issues with application. Wedding season may traditionally be spring, but wedding cake is good all year round. 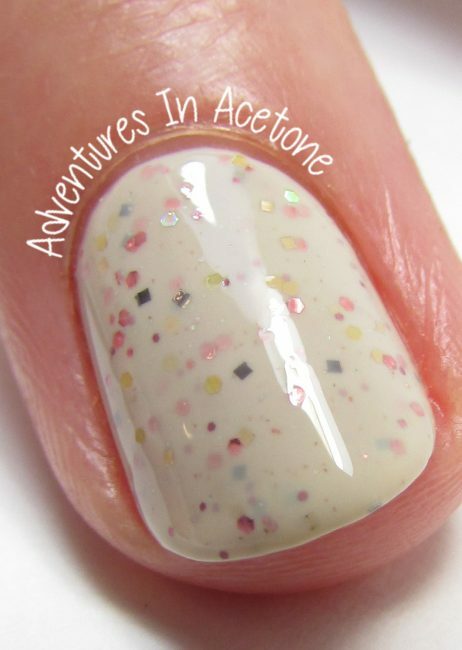 A soft cake batter color base is filled with pops of gold holographic glitters and pink glitters, while nutmeg and micro holographic glitter adds a hint of spice. I’m showing three coats with top coat below. I love the base and glitter combo in this one so much! A soft sage green, this earthy polish is filled with copper, lavender and silver glitter. A sprinkling of holo dust adds subtle depth. Another lovely combo of base and glitter colors. 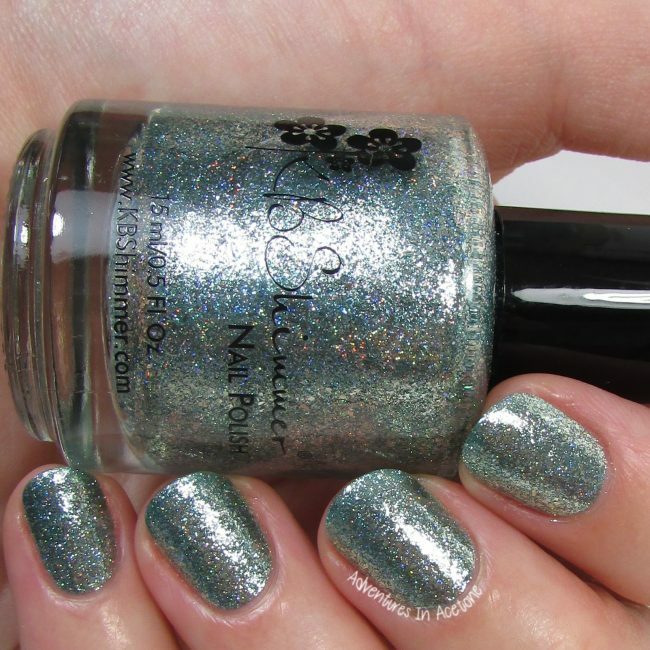 This minty metallic polish is loaded with silver flakes and holographic sparkle. If you loved our birthstone collection, this is a must have! The addition of the silver flakes to the holo glitter is gorgeous! This soft “baby” blue was inspired by the 2016 Pantone color of the year Serenity. 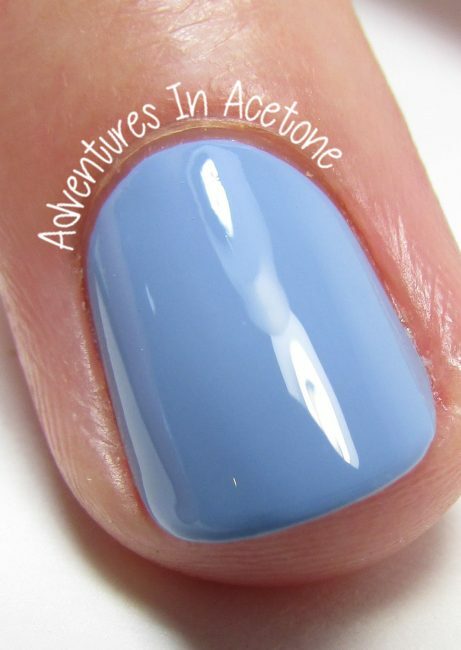 The creamy pastel blue is the perfect transition shade for fall, with its calming feel and 2 coat coverage. This was another creme with great coverage and was almost a one coater. This deepened lavender color polish is loaded with a pinky red micro flakie that adds a fun dimension to this mum inspired polish. The first coat went on thin and patchy, but it built up nicely after that. Orchids come in a wide mix of colors, from pale whites to deep purples. Inspired by the orchids of Christy’s mother, this polish has a warm purple base that leans fuchsia, amped up with some linear holographic pigment for a fantastic rainbow flame. I’m showing two gorgeous coats below with top coat. Orchid holos get me every time. LOVE. Fright This Way is a Halloween inspired polish with a deep black base and a scattering of holo dust and loads of purple glitter. 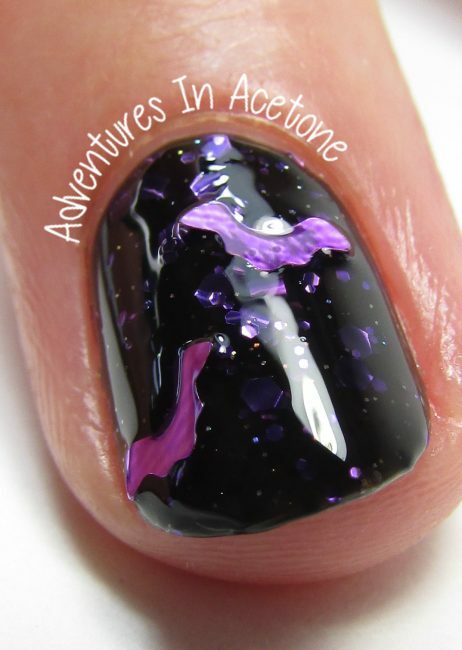 At certain angles this polish looks plain black, but when the light catches the glitter, the purple pops! 2-3 coats recommended. Pair with the loose bat glitters we include with this polish! I’m showing three coats below with top coat and added bat glitter! I did have to do two coats of top coat to seal in the bats, and they were a little big to lay flat enough on my curved nails. 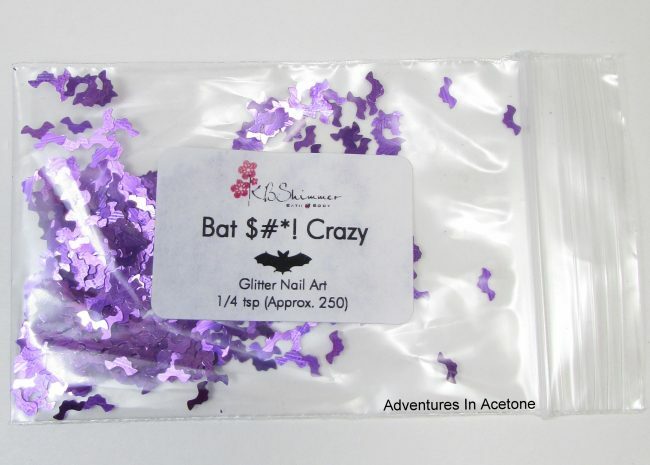 Free with fall collection orders (while supplies last), metallic purple bat glitters, ideal for pairing with Fright This Way! We hate to admit it, but chocolate cake is our weakness! Moist, deep and dark, there is nothing that can make chocolate cake better, unless it is ganache! 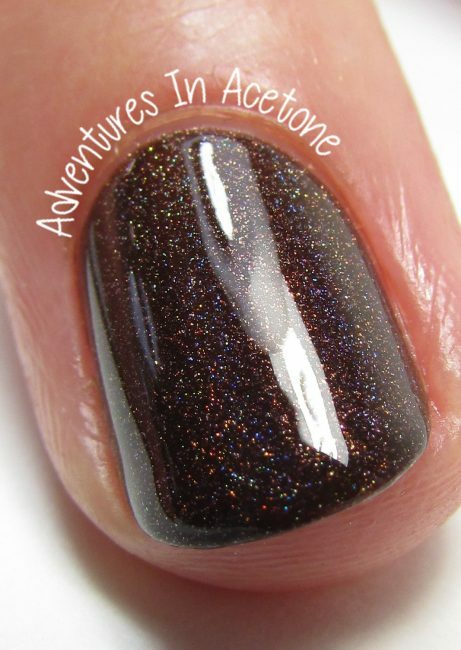 Inspired by that rich chocolate glaze, Oh My Ganache is a rich chocolate-colored linear holographic polish. I’m showing two easy coats with top coat below. This brown holo had gorgeous coverage and it’s lovely. 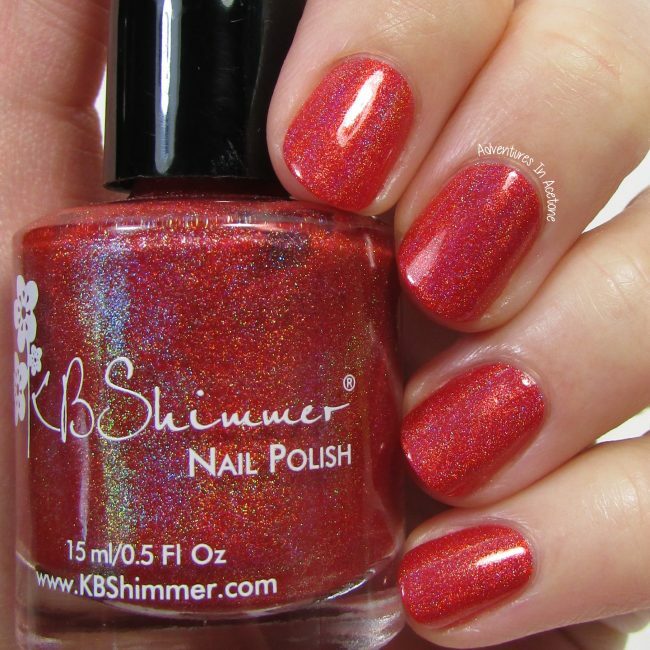 What do you think of this new fabulous collection by KBShimmer? Available starting August 19th, KBShimmer’s Fall 2016 Collection will retail for $9.25 each at KBShimmer.com, Amazon.com and select salons & retailers. 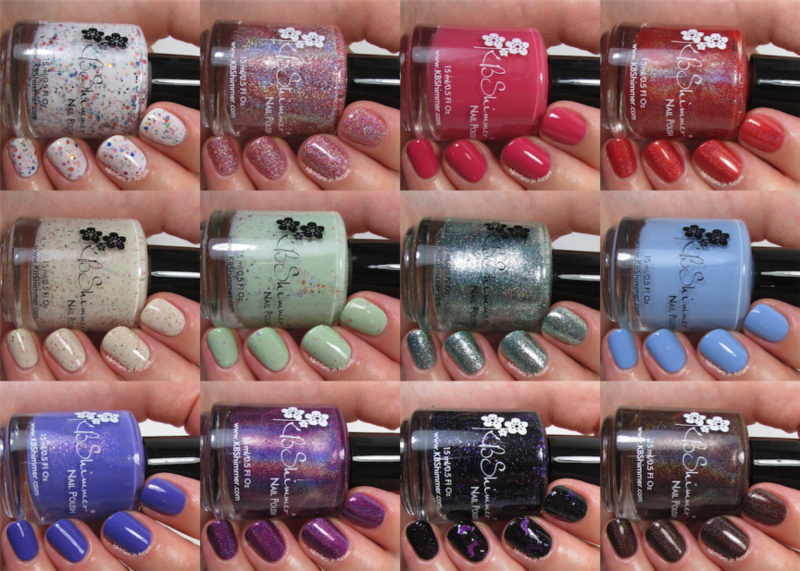 For sales outside the U.S., visit www.harlowandco.org, http://www.livelovepolish.com or http://color4nails.com. Wow this is such a diverse and glitter filled collection. I love that first polish and the bat glitters, they’re so fun. Your swatches are amazing as always, I really struggle with glitters and the glare from my lights. These are such beautiful colors! I love almost all of them. Wowzers Jackie I bought -0 my ganache & Orchidding me. OMG those are. Beautiful thanks for the swatches.. Jepedy decidon 100%.